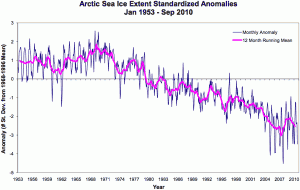 Arctic sea ice recovery – WTF!!! I know I shouldn’t really be surprised by anything in the climate change debate, but I can’t help but be flabbergasted by the recent discussion about the supposed Arctic sea ice recovery. This started with an article by David Rose in the Mail on Sunday claiming that we’re heading for a period of Global cooling. This was then repeated in the Telegraph. This all appears to be based on the observation that the September Arctic sea ice extent this year (2013) is an increase of 60% on that of last year. I know this has already been covered by Dana in the Guardian and by Sou over at HotWhopper, but I thought I would add my own two cents worth. Firstly, the claim that the Arctic sea ice has “recovered” because this September’s sea ice extent is a 60% increase on last year is absurb. Last year (2012) was an extreme low, so a 60% increase on that does not bring us back to levels similar to what they were prior to the start of the decline. Furthermore, this is a classic example of regression to the mean. The Arctic summer sea ice extent is not the same year on year. Natural variability means that sometimes it is lower than normal, while at other times it is higher. Consider the figure below. It shows the monthly Arctic sea ice extent anomalies (blue line) and a 12 month running mean. It’s clear that there has been a significant decline since the 1960s but there is still substantial variation. Furthermore, given that the scatter is around the running mean, if you have a particular low anomaly one year, you don’t expect another low the year after. Claiming that a 60% increase on the very low value last September is a “recovery” is absolute nonsense. Furthermore, some have claimed that the sea ice extent now is the same as in 1971. The figure above only goes to 2010, but given that 2012 was a record low and 2013 is a 60% increase on that, this claim doesn’t appear true. There are, however, some quite low anomalies in the 1970s that appear similar to some more recent values. However, claiming that Arctic sea ice has recover because an extreme high today is similar to an extreme low from the 1970s is also absurd. Natural variation! What is also ignored (despite my attempts to get some to recognise this) is that all of this is based on sea icea area/extent. From an energetics perspective (i.e., how much energy is absorbed in melting Arctic sea ice) it’s the mass/volume that’s important. If you consider the figure below (which I got from Neven’s excellent Arctic Sea Ice Blog), the change in volume/mass is much greater than the change in area. Based on mass/volume it’s even harder to claim that there’s been a recovery (presumably why those who make this claim would rather focus on area than volume). Another claim is that even if Arctic sea ice is decreasing, Antarctic sea ice is increasing. People think that because they both have the same terms (sea ice) that they’re equivalent. Well, they’re not really. One immediate difference is that an increase in Antarctic sea ice doesn’t cancel the change in albedo due to decreased sea ice extent in the North (i.e., it’s winter in the South). Also, Antarctic sea ice tend to be thinner than Arctic sea ice (or at least this used to be true) and so even if the change in area is the same, the change in volume/mass probably isn’t, especially as the increased Antarctic sea ice will be in the northernmost portions of the region. There’s also natural variability, so an increased amount of Antarctic sea ice this year (or for the last couple of years) doesn’t make a trend. The figure below is from the National Snow and Ice Data Centre and shows that since 1978 there has been a modest positive trend (100000 km2 per decade) in Antarctic sea ice. This is 5 times smaller (in magnitude) than the Arctic sea trend (and that’s the trend in extent, not mass/volume). So, no, increases in Antarctic sea ice have not compensated for decreases in Arctic sea ice. 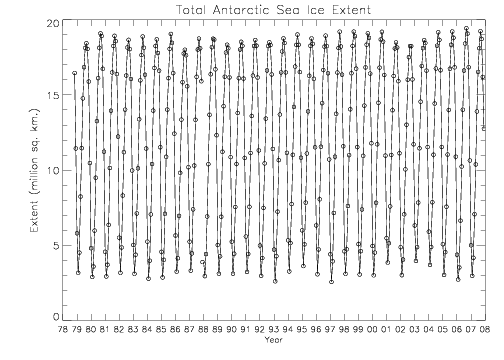 Total Antarctic sea ice from NSIDC. I don’t really know what else to say. No, the 60% increase in September sea ice this year on last year is not a recovery. No, the sea ice extent this year is not the same as in 1971. No, the increased Antarctic sea ice does not compensate for reduced Arctic sea ice. This is an example of an aspect of the debate that just makes me despair. How can anyone dispute the reduction in Arctic sea ice? It seems indisputable, but people still manage to do so. Is it ignorance? Is it deliberate? Is it unfounded optimism (I don’t really want it to be true either)? I really don’t know and I really don’t know how to deal with people who won’t accept the reality of Arctic sea ice decline. This entry was posted in Climate change, Global warming and tagged Antarctic, Arctic, arctic sea ice, David Rose, Mail on Sunday, Polar ice packs, Sea ice, September, summer sea ice. Bookmark the permalink. 40 Responses to Arctic sea ice recovery – WTF!!! Thanks. I was actually aware of that paper and meant to add a comment about it in the post, but forgot. Thanks for adding it in a comment. I’m not surprised at all by these claims and behaviour. It’s something that I predicted that would happen with the low record of 1012. As almost always the next year will have a greater sea ice extent. We saw the exact same thing with the low of 2007 that was followed by a few years of increased sea ice extent. Exactly. Maybe you can clarify something for me. When I compare the two figures in the post you linked to (and that you wrote). They don’t seem consistent. The difference between the anomaly in 1990 and 1970 seems bigger in the bottom figure than in the top. Is there a reason for this, or am I missing something obvious? It is surely deliberate (the people who dispute the reduction in Arctic sea ice). I saw a couple of tweets about that article and Judith Curry appeared to be in agreement with it. She is not a moron so it must be deliberate. What else can it be? The very first sentence (beneath the title) of the Rose article says that experts are predicting global cooling. This is news to me. Yes, Judith Curry’s response is quite remarkable. You would imagine someone with her background would understand that a 60% increase on the lowest summer sea ice in recorded history is not a recovery. Either she really does not understand the fundamentals or, as you say, it’s deliberate (which is worse in my opinion). I don’t know where Rose gets the “experts predict global cooling from”. Probably just made it up. That doesn’t appear all that unusual, sadly. Oh, you can always find “experts” that predict a cooling. It’s all in what one considers “experts”. I wonder if it’s a re-run of the misrepresentation of Mojib Latif that was popular amongst fake sceptics a few years ago? Either that or Rose is misrepresenting the proposed cool-phase IPO as climate cooling. It’s hard to care really. Rose is a serial misrepresenter and we all know where the Mail gets its misrepresentations from – the GWPF. Read all about it! Exclusive! For increase in Antarctic sea ice extent, see also Holland & Kwok (2012) Wind-driven trends in Antarctic sea-ice drift. It’s paywalled but there’s a press release here. That’s because they aren’t consistent with each other. The detail here is that they were created by two different organisations and there’s a difference between the creation of the two graphs of over two decades (as you will be aware science progresses and methodologies change and improve). What I did in that article was to point out flawed logic and using graphs that you can’t even do an eyeball comparison to see if he has a point. Looking at a current graph showed he didn’t because then you could see what happened after 1990. He also basically focussed in on natural variability without placing it into any context of what that meant. But I didn’t talk about that as I found it a minor detail compared to the graph issues. Is it acceptable for a journalist to write a piece in one newspaper, and then repeat it under a pseudonym in another, which seems to be the case here. Surely that violates some ethical rule? If a scientist did that, whatever would James Delingpole say? Hi, wotts. I hope I don’t come across like a total idiot but a 60% recovery _ doesn’t that mean that it’s still 40% down on the average? And if so, how can anyone interpret it as a recovery? It’s not quite that. It’s a 60% increase on the value in September 2012. The minimum in September 2012 was 3.4 Million km2. This year it appears to be about 5.5 Million km2. Hence this year in September it is 60% greater than it was last year in September. If you go back to the early 60s, however, the September minimum was more like 8.5 Million km2, so this year’s supposed recovery is still only 65% of what it was 50 years ago. Your last sentence is precisely the problem I have with this whole situation. How indeed? Is there some evidence that David Rose also wrote the Telegraph article? Amazing if so. With a recovery like this in progress, the Panama Canal should look to its future. That is what I understood from Sou’s blog. David Rose apparently also writes as “Hayley Dixon” for the UK Telegraph?? I do notice the question marks – perhaps she is just commenting on the strange similarity of two articles appearing in two different newspapers on the same day. Maybe there is someone in the background just jerking the strings. Can we be sure that David Rose was basing the 60% increase on September values? He doesn’t give any context to the claim in the article. My suspicion was that he was basing it on incorrect figures given by NSIDC for the August average. They originally said that August 2013 was 2.38 million km^2 or 919,000 square miles above the August 2012 extent. This would be consistent with the other claim that the ice sheets have grown by 920,000 square miles. NSIDC has now corrected the values to 1.38 million square kilometers (533,000 square miles). If he is basing the 60% claim on the September minimum it would still be wrong as the ice has continued to melt, and as of 9th September was 5.15 km^2, which is only 51% more than the 2012 minimum. I think we probably can assume that he was basing it on the September figures. He says “the rebound from 2012’s low”. That certainly doesn’t mean that he was right and, as you say, it seems like it will end up being lower than a 60% increase. While I do agree with this, the area is still important because of the difference in albedo between ocean water and ice. Indeed, and I made that point later when discussing why increases in Antarctic ice don’t really compensate for reductions in Arctic ice coverage. A 60% recovery over the previous year is actually quite remarkable, but maybe not in the way that Rose intends. If natural variations can account for a 60% rise at this point then it means we are very close to 0. Exactly. I read, today, that we would actually expect the size of the variations to increase as the amount of Arctic sea ice decreases, so such a large relative change is not that surprising. Last week it was global cooling, now it’s global warming again, but just half as much as previously thought. You’d have to be able to accept pretty strange inconsistensies to take David Rose seriously. It’s true that the sea ice extent at the moment (Nov/Dec) happens to be close to the sea ice extent for this period in 2003. However, the variation in sea ice extent at this time of year is somewhat smaller than the variation in September. Since this summer’s extent was not a low, it’s not all that surprising. Also, as usual, it completely ignores that this refers to the area, not the volume. If one considers this, the Arctic sea ice volume has not recovered to the 2003 level (i.e., the amount of sea ice in the Arctic continues to decline). I don’t know if Judith Curry’s recent work is being taken seriously or not, but it doesn’t really contain any physics so doesn’t really explain why these stadium waves might exist (assuming that they do). However, we can say – without even being remotely hysterical – that it’s almost certainly not magic. Including 2013, the linear trend in November ice extent is –4.9% per decade relative to the 1981 to 2010 mean, or –53,500 square kilometers per year (–20,700 square miles per year). 1) 2003 is a cherry picked comparison, being appreciably lower in extent than any year preceding it, and the two years following it. 2) 2013 lies only a little above the trend line, which the data is expected to vary around. 3) That of the last eleven years, five had lower and five higher sea ice extent in November. Form this data, Jack Gabel’s fervid imagination builds a sea ice recovery. The current refreeze in the Arctic is about 4 days ahead of the average over the last 7 years. I doubt many things would be able to handle a cycle as powerful as that. Jack, if you’re serious about a discussion then maybe you’ll recognise that Tom’s response is partly motivated by the (entirely justifiable) view that anyone with a very basic understanding of data analysis should very easily see (as Rachel shows with the graph) that 2013 is not a recovery. There will be some years above the trend line, and some below. Suggesting that a year in which the sea ice is well above the trend line is a recovery because it is similar to a year when extent was much closer to the trend, is poor interpretation of the data. It’s also a standard “skeptic” technique, so is not well received by many. That doesn’t mean I’m not interested in a discussion, but would at least expect the other party to be actually skeptical rather than simply suggesting that they’re being skeptical. I’m also unclear as to what you’re implying with respect to the models. One can infer a long term decrease in Arctic sea ice extent from observations alone. 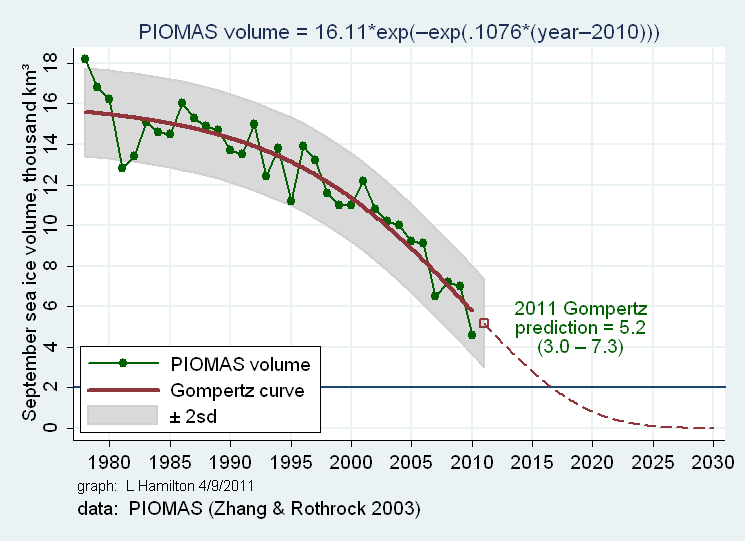 Adding some modelling (such as PIOMASS) allows one to also consider mass (which, with respect to global warming) is more relevant. Everything indicates that we’re seeing a continued decline in Arctic sea ice. This, together with a continued increase in ocean heat content and (despite what you might have heard) a likely increase in surface temperatures, indicates that overall global warming continues and is consistent with a top-of-the-atmosphere energy imbalance of something like 0.5 to 0.7 Wm-2. I agree that Judith Curry shouldn’t be regarded as a heretic. I’ve certainly never said as such. I don’t, however, think the Wyatt & Curry paper is particularly valuable bit of work. It’s a form of curve fitting and without any physics, doesn’t even begin to explain why such cycles should exist. I will add, however, that referring to Galileo, in my opinion, rather weakens your argument. Just because someone happens to be suggesting things that many disagree with, does not imply that they’re the next Galileo. It is much more likely that they’re just wrong. Galileos, Newtons, Einsteins, and Feynmans, are few and far between. I believe this is more because they’ve been criticised in the past for not explaining their uncertainties properly. Criticising them, now, for having such controls seem a little disingenuous. I’m not quite sure what you’re getting at with your links. The first seems to be a newspaper article. The second seems to be consistent with the current Arctic sea ice extent being lower than it’s been for at least a century, and the last is Neven’s post trying to point that the last time CO2 was as high as it is today, the Arctic warming was significant. To be clear, I’m a professional scientist, but not a professional climate scientist. Really? Are suggesting that criticising what someone says or what someone supports (on their blog) qualifies as a personal attack? Not a particularly scientific attitude, I would suggest. No need to. That’s certainly not required and nor is it my goal. How you, personally, feel about what is likely happening is entirely up to you. ” According to the latest and most comprehensive paleoclimatic analysis, which brought us high resolution temporal data back to the Pliocene (Brigham-Grette et al., 2013, Science), summer temperatures in the NE Arctic region were ~8 °C higher compared to present-day climatology. Jack, you’re right they have been quite strongly worded responses. truth is I’m nobody, a poor artist, not a scientist, who cares what I think or feel? Except your first post, surely implied something with respect to Arctic sea ice recovery. If you’re simply a poor artist, why not choose to phrase it in a way that indicates that you’ve noticed something, but are unsure of the significance. I think you misunderstand the role of consensus studies in the field of climate science. It’s not to force people to accept a consensus view, it’s to illustrate that a consensus exists. As a scientists, it is fairly clear that with respect to global warming, the physics is extremely well understood and the consensus studies are there to illustrate this agreement. It’s the scientific agreement that’s driving the consensus, not the expectation of consensus that’s driving the science. You may not believe me, but that doesn’t make what I’m saying wrong. In case you’re wondering, I’ve been moving the blog to a new address. If you wanted to comment further, you can do so here. Your last comment caught me out, so didn’t make the transfer.